I had such high hopes for this book, due to rave reviews from the likes of Tor.com and io9. I am pretty bummed that to be disappointed. To be fair, I expected this to be a post-apocalyptic science fiction book. After reading, it’s much closer to horror. In my defense, the back cover summary made it sound like post-apocalyptic SciFi – 11 expeditions have ventured into Area X, the first of which found paradise. The rest met various gruesome ends. Expedition 12 is about to head out to explore the mysterious area lurking beyond the border. I’d love to be more specific, but the book doesn’t have named characters or provide any meaningful background, even as the story unfolds. I never got the context that could have saved the novel for me. The novel is set up as a mystery, but never has the payoff of a solution. Instead, strange elements are introduced, abandoned, returned to, subverted, and abandoned again. There’s a tunnel that’s also a tower and possibly alive, a lighthouse that draws expedition members for no apparent reason, hypnosis that doesn’t seem to work like real-world hypnosis, and a main character who may be glowing or losing her mind or both. The mere 195 pages are filled of descriptions that manage to leave you without a clear picture of what is being described. Basically, there’s a lot going on without anything to tie it all together. VanderMeer does an excellent job creating a creepy atmosphere – I couldn’t read it before bed once the main character really got to exploring the strange landscape. Yet, as the tiny novel progressed, my general confusion displaced any lingering fear I might have had. Verdict: Dismissed. Though this is the first in a trilogy and later installments may provide the answers I was waiting for, I have no desire to proceed any further into this convoluted series. Some members of the DC book club were fans though, so if a horror novel that leaves most to your own interpretation sounds intriguing, check it out. 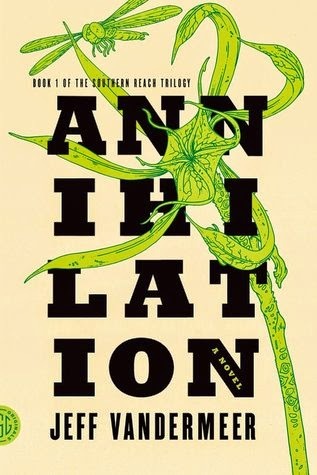 “Annihilation” by Jeff VanderMeer, published by FSG Originals on February 4, 2014.